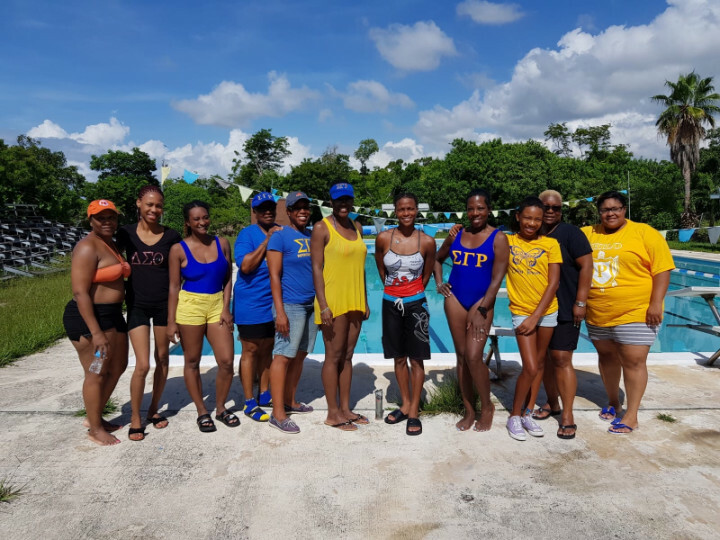 SWIM 1922 participants at Bishop Michael Eldon HS (L-R) Shanae Albury, Shavonna Morris , Jaleesa Grant, Judy Rodgers, Olethea Gardiner, Afrika Karamo-Miller, Freeport Aquatics Club Coach Khadihja, Kim Campbell, Kyndall Campbell, Elcina Duncombe and Grier Rodgers. 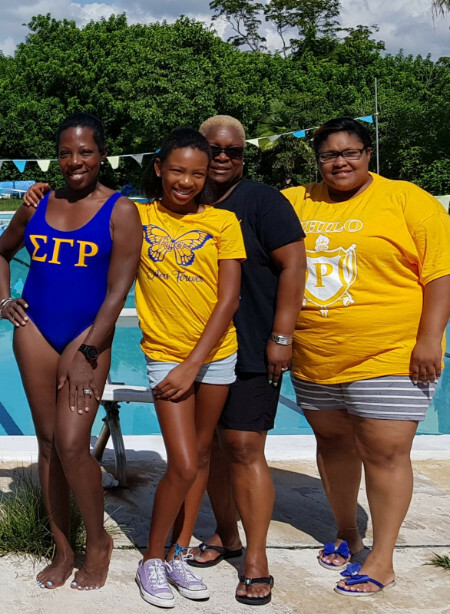 Freeport, Grand Bahama – The Zeta Rho Sigma chapter of Sigma Gamma Rho Sorority, Inc. and the Freeport Aquatics Club (FAC) announce their partnership to prevent drowning and increase swim participation, with the SWIM 1922 program. On Saturday, August 11th and August 25th, 2018, SWIM 1922 Adult Swim Clinics will be held at the Bishop Michael Eldon High School Pool, E. Sunrise Highway, beginning at 8:30am. The clinics are open to the public and the cost is $10.00 per session. The two organizations will advance their efforts to increase awareness about water safety, the need for swim lessons and participation in swimming at a grassroots, community-based level. 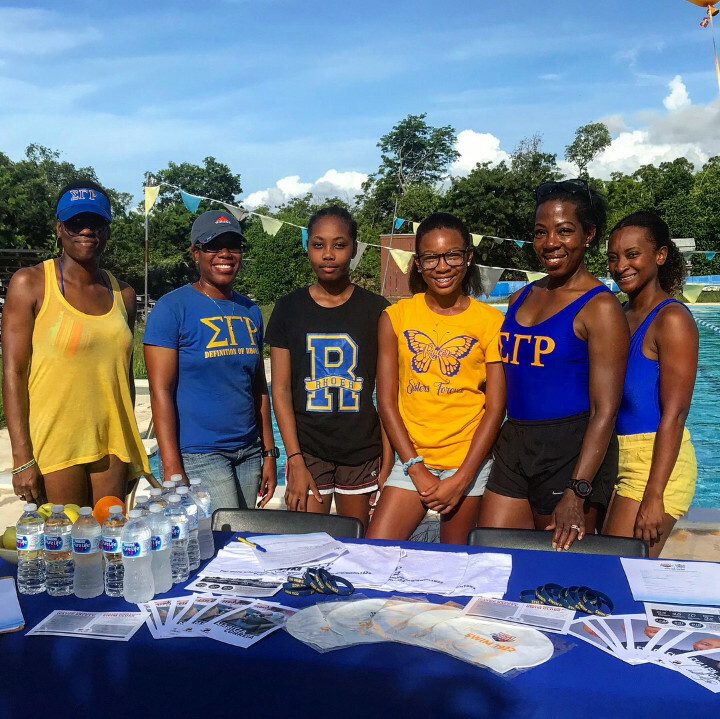 As an international initiative of the Sorority, members of Sigma Gamma Rho, in corporate partnership with USA Swimming, promote participation in the communities where they serve through in-water safety events, workshops and fitness swimming. The “SWIM 1922” program, named for the year our sorority was founded, aims to increase swim participation and decrease drowning rates in our communities. Drowning is one of the top five leading causes of unintentional death/injury in The Bahamas. (L-R) Sigma Gamma Rho Sorority, Inc., Zeta Rho Sigma Alumnae chapter members: Afrika Karamo-Miller (President) (L) , Olethea Gardiner, (2nd L), Kim Thompson Campbell (2nd R), Jaleesa Grant, Rhoer Club (Sigma Gamma Rho youth group members) Avia Bevans and Kyndall Campbell. Sigma Gamma Rho currently boasts three Olympians among its sisterhood. Olympic silver medalist Martiza Correia McClendon, became the first black female swimmer to earn a spot on the U.S. Olympic team and went on to earn a silver medal in 2004. Jamaica Olympian and world record holder Alia Atkinson became the first black woman to earn a swimming title, recently won three gold and bronze medals at the CAC Games in Barranquilla, Colombia. She also holds a number of national records and short course world records in the 50m and 100m breaststroke. Three times Olympian, Arianna Vanderpool-Wallace, was the first Bahamian ever to make the final in Olympic competition. In 2010 she won a bronze medal in the 50m freestyle at the World Championships in Dubai. In 2015, she won a gold medal in the 50m freestyle and a bronze medal in the 100m freestyle during the Pan America Games in Toronto. Sigma Gamma Rho Sorority, Inc.., an international collegiate and non-profit community service organization, was founded on November 12, 1922 on Butler University’s campus in Indianapolis, Indiana. It has welcomed more than 90,000 members that have joined the organization as undergraduates and professionals. Official affiliate groups include Rhoers (young girls) and Philos (friends of the sorority). The sorority has more than 500 chapters in the United States, The Bahamas (Grand Bahama and New Providence), Bermuda, Canada, Germany, Korea and the U.S. Virgin Islands. It is the mission of the sorority to enhance the quality of life for women and their families in the U.S. and globally through community service. Programs, initiatives, and partnerships are devoted to progress in the areas of education, healthcare, political action and leadership development. Sigma Gamma Rho Sorority, Inc. is headquartered in Cary, North Carolina and is a member of the Pan Hellenic Council’s “Divine Nine.” For more information, visit www.sgrho1922.org. 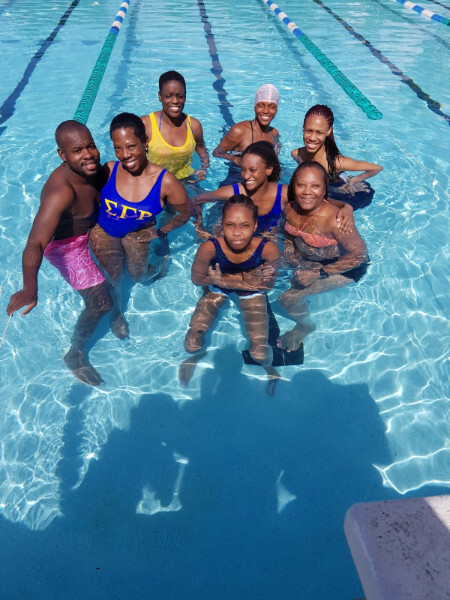 The Freeport Aquatics Club (FAC), led by Head Coach Albert Bell, is an all-inclusive swimming club that offers competitive and non-competitive swimming for children and adults. The goal of the FAC is to provide participants the opportunity to improve swimming skills and achieve success at his or her level of ability, from novice to international competitor. (L-R) Sigma Gamma Rho Sorority, Inc. member Kim Campbell with her daughter Kyndall Campbell. Elcinca Duncombe of Sigma Gamma Rho and Philo Club (Friends of Sigma Gamma Rho) member Grier Rodgers. 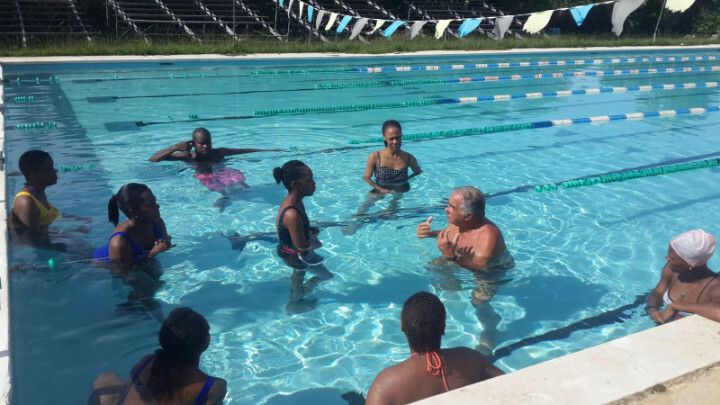 Freeport Aquatics Club Head Coach Bert Bell teaches SWIM 1922 participants the basics of floating and breathing in the water. SWIM 1922 Clinic participants: Mitchum Jasper, Kim Campbell, Afrika Karamo-Miller, Freeport Aquatics Club Coach Khadihja, Shavonna Morris, Jaleesa Grant, Shanae Albury and Avia Bevans. 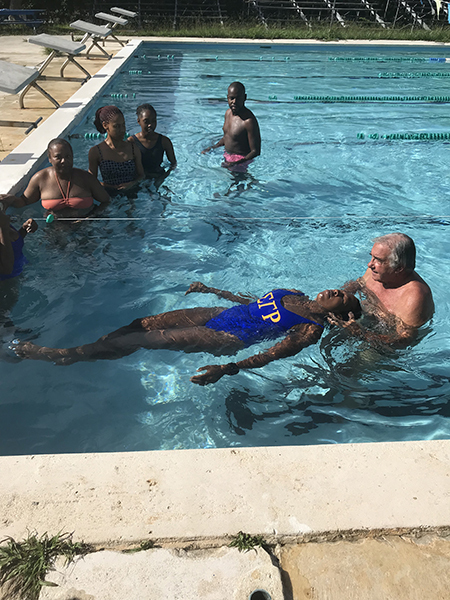 Freeport Aquatics Club Head Coack Bert Bell teaches Sigma Gamma Rho Sorority, Inc. member Kim Campbell how to float in the water.